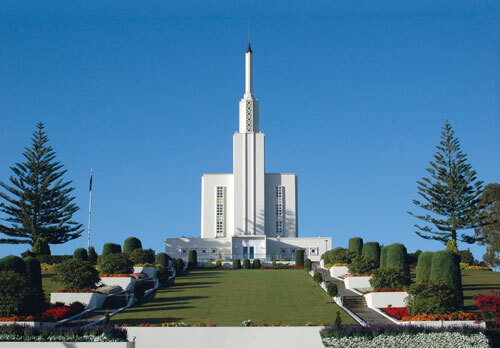 The Hamilton New Zealand Temple is the most striking building in a complex established by the Church of Jesus Christ of Latter-day Saints (Mormon Church) south of the city in the 1950s. It is constructed of white-painted reinforced concrete blocks made on the site. In December each year trees and bushes around the temple are illuminated by more than 100,000 Christmas lights, and choirs perform carols for visitors.